Our Medi-spa treatments are not only scientifically advanced and technologically cutting-edge, they give results! Completely safe and with no downtime, you’ll see and feel a noticeable difference after only one treatment. For best results, we recommend a series. We will of course recommend the best combination of treatments for your individual skin concerns. Elemis BIOTEC delivers 8 NEW highly-effective, super-charged facial treatments to re-boot cellular performance, enhancing the skin’s ability to repair, renew and re-tone. Revealing a new generation of facials, each treatment targets specific skin needs to deliver immediate, visible, long-lasting results. The skin’s unique bio-chemistry is constantly compromised. Lifestyle, sunlight, stress, age, illness and medication cause a breakdown in cellular energy and communication, resulting in a weakened skin structure, stressed and unbalanced skin. Unresponsive cells need NEW STIMULI to help re-boot cellular performance and re-establish effective cell communication, enhancing the skin’s ability to repair, renew and re-tone. After in-depth studies and research, Elemis found that combining a unique synergy of 3 targeted STIMULI – TOUCH, TECHNOLOGY and ACTIVES – it was possible to deliver immediate, visible and longer-lasting results. Delivered in 30, 60 or 90 minutes, each BIOTEC facial combines a unique high-potency activator and specially designed Elemis Skin Lift Touch. Using the power of hands-on therapy, the Skin Lift Touch softens and prepares the skin. Significantly improving skin function, it enables it to convert energy from each technology and “receive” the actives more effectively, whilst re-balancing the skin’s micro-flora. 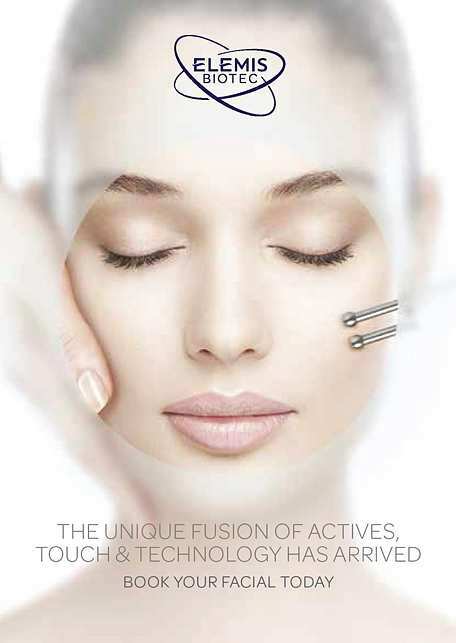 Biotec Line Eraser Facial – The ultimate wrinkle-smoothing facial to rejuvenate ageing skin. This 30 minute concentrated treatment targets fine lines, wrinkle depth and ageing. The eye area is left toned and tightened. Can be added to any 30, 60 or 90 min Biotec facial. This 30 minute concentrated treatment targets sagging skin and crepiness, leaving the jawline tightened and contoured. Can be added to any 30, 60 or 90 min Biotec facial. Biotec Skin Resurfacer – Revolutionary resurfacing facial to even skin tone, reduce blemish marks and smooth fine lines. Biotec Radiance Renew – Radiance-boosting, bio-electric facial to energise tired, dull and stressed skin. Biotec Blemish Control – Deep cleansing, light therapy facial to visibly clear and re-balance oily, blemish prone skin . The benefit: Results for almost every skin type, particularly sun damaged, pigmented, scarred and enlarged pores. Microdermabrasion is also great as a one-off pick me up to give your skin’s health and appearance a boost. To get the best results from your MDA treatment we follow with a treatment mask to nourish, hydrate and calm your skin. It can also be combined with our Oxygen or Light therapy add-ons below. Oxygen therapy works to re-energise skin cells and reverse free radical damage, thus plumping up tired and sallow skin, providing new healthy skin and reversing the signs of ageing. Light therapy helps repair the skin, visibly reducing pore size, whilst clearing the complexion. The science: Skin resurfacing using micronized crystals. For best results, we say: Great as a one off treatment but this treatment works best as a regular treatment supporting your skin regime – we recommend an initial course of 6 treatments at 7 to 10 day intervals, followed by a maintenance session every 4 weeks. The benefit: This intensive pulsed-light treatment can be used to treat a wide range of problems, including red veins and vascular lesions, pigmentation and ageing from sun damage, giving your skin a clearer, even and younger looking tone and texture. It is a safe, non-surgical treatment for many skin conditions often brought about by age or over-exposure to the sun. The science: The Energist VPL treatment uses short, safe, controlled pulses of filtered light to rejuvenate your skin. For best results, we say: A course of treatments. Buy a block of 4 and receive 10% off standard price. A patch test and consultation costing 40CHF is required at least 24 hours before treatment and is redeemable against any course of treatments booked. Help nature with a little nurture. The science: Lumicell Touch is a revolutionary treatment. Using gentle vacuum suctioning and deep subdural massage, while incorporating the benefits of light based technology, the infra red and magenta light stimulate fat elimination and promote anti ageing in cells. Clinical trials have shown that lumicell touch significantly reduces cellulite, stimulates cellular metabolism and aids in inch loss. For best results, we say: A minimum of 14-18 treatments are recommended, maintenance is also recommended. This massage motion, with its special direction of flow, increases circulation and gently but thoroughly decongests the problem areas of hips, thighs, buttocks. Treatment is also possible for upper body. The Body Ballancer® action accelerates the removal of waste products and excess fluid via the lymphatic system, reducing the appearance of cellulite, improving skin tone, and reducing volume in areas affected by excess fluid retention whilst Its gentle, rhythmic action promotes deep relaxation, helps alleviate symptoms of stress and improves sleep quality. Circulatory system- Ballancer peristaltic corporal massage will act as an ‘external’ heart. It will enhance blood circulation by gently applying unidirectional peristaltic pressure on peripheral veins. Blood circulation improved, the elimination of toxins is facilitated and more fresh oxygen reaches skin cells. Digestive system –Ballancer will compress and massage the abdomen. The result is relaxation of the abdominal muscles and at the same time a healthy stimulation of the bowel movements and more efficient evacuation of poisonous content. Lymphatic system- Lymphatic flow is enhanced. Lymph flow is improved, both in the peripheral and deep lymph nets. The results are the evacuation of metabolic residuals from the interstitial spaces. The immunological system is benefited as well. Muscles –Ballancer massages the muscles. The peristaltic movement relaxes the muscle, drains it from excessive liquids that are a product of the muscle effort, thus calming muscles spasms. Skin –Ballancer massage will allow open flow of freshly oxygenated blood to the skin layers. Skin will look better, feel better, will regain its tone and will be firmer – visually and physically. If treatments are performed regularly, cellulite will be prevented and even eliminated. In Pregnancy – During pregnancy a number of women suffer from Edema (water retention) such as swollen ankles or feet and circulatory issues such as varicose veins in the legs. 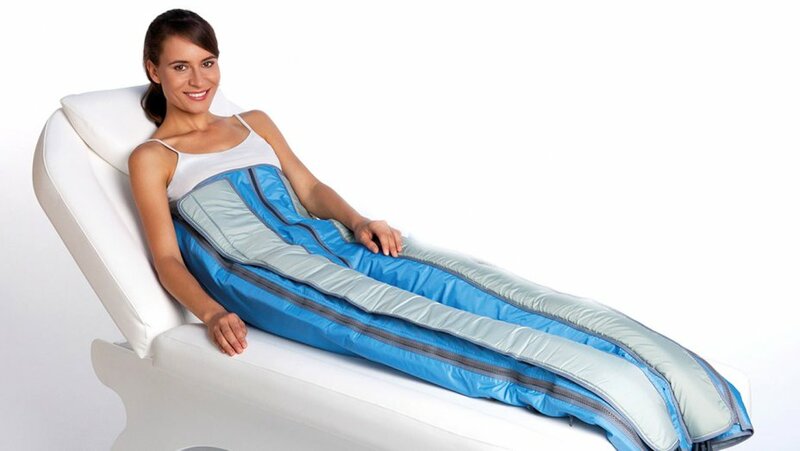 Using the Ballancer® will assist in the lymphatic drainage and increase circulation therefore relieving the discomfort caused by the circulatory alterations and feeling of heaviness in the legs. The internal draining will also reduce the risk of developing thrombosis during the final stage of pregnancy or during birth.The abdomen area is left free during treatments. One, two or three treatments a week is enough to eliminate the fluid that has accumulated in the cellular tissues. For best results, we say: We recommend a course of treatments to see the best results and significant improvements, but you’ll be able to notice a difference after just one session. After the first treatment you will feel lighter, slimmer and energised. A course of 3 x week over a minimum of 4 weeks is advisable in conjunction with a healthily diet and regular exercise. Please wear loose, comfortable trousers like leggings or joggers (preferably not jeans for your own comfort) and socks to cover your feet. We can provide disposable garments if necessary. It is also not advisable to have eaten a big meal within an hour of your treatment. A fantastic addition to your facial, eyelash extension service or pedicure, can be done during these treatments, saving time! Price reduction (-25CHF) when added to any Biotec Facial (60 or 90min). See our Hair Removal page to find out more about the life-changing VPL treatment.